The Ag. Vice-Chancellor, Rev. Fr. 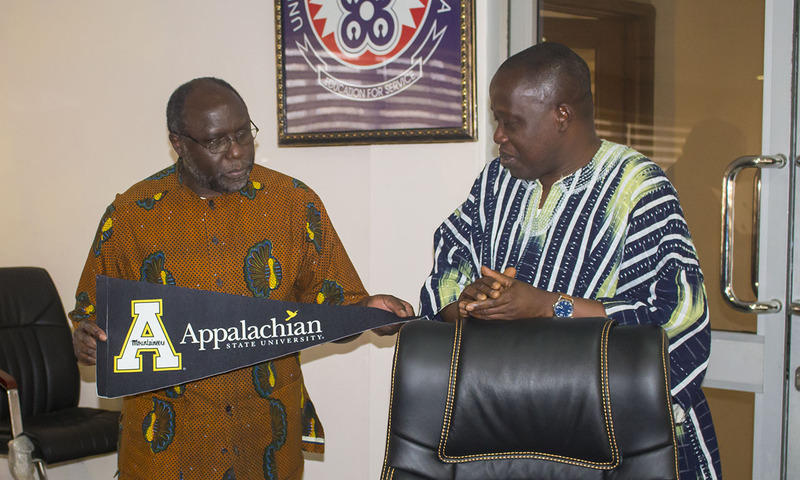 Prof. Anthony Afful-Broni says that the University of Education, Winneba (UEW) is well positioned to work with Appalachian State University. 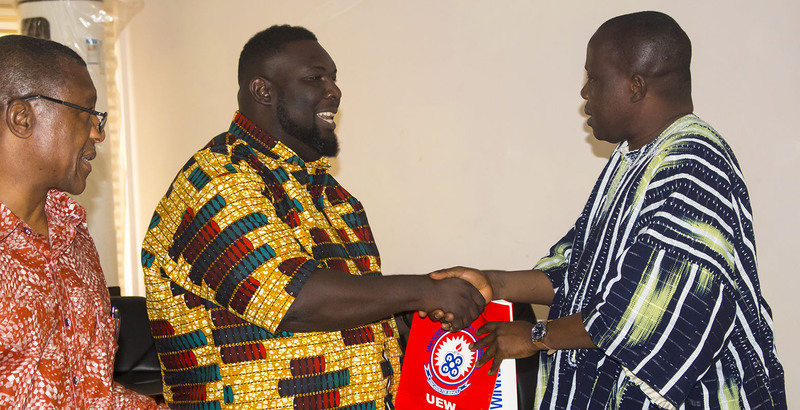 He said UEW has equipped itself with the needed structures, to accommodate and provide quality teaching and learning services to staff and students of Appalachian State University should the two institutions agree to sign a Memorandum of Understanding (MoU) to regulate their relationship. The Ag. Vice-Chancellor made this revelation during the visit of Associate Vice-Chancellor for International Development of the Appalachian State University, Dr. Jesse Lutabingwa to UEW on Friday, 11th May, 2018 at the Council Chamber, North Campus, Winneba. “Thank God for your initiative to establish a relationship with our University. We do have facilities that would enhance effective teaching and learning. Through the African Virtual University and our Video Conferencing Facilities, we will say we have the needed ICT infrastructure to support our activities. As I speak, we have three other campuses. 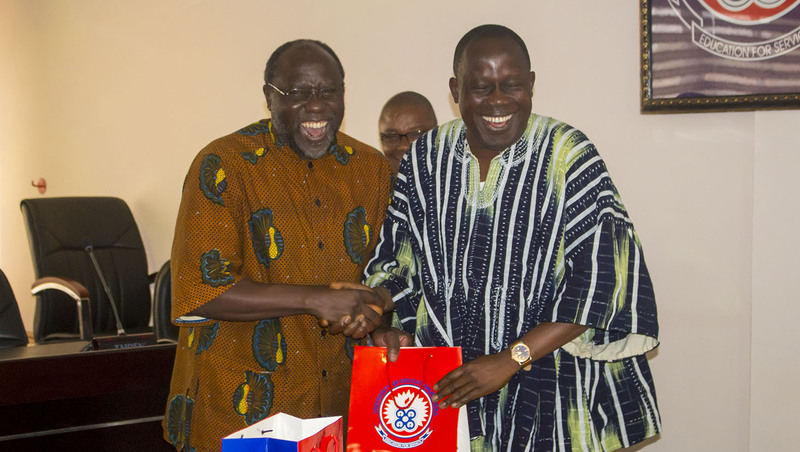 We use our Video Conferencing Facilities to teach classes and hold meetings on the campuses at the same time and we are in the process of improving them further.” Prof. Afful-Broni said. In his address, Dr. Jesse Lutabingwa indicated that his visit was to see how best both institutions (UEW and Appalachian State University) could enter into a collaborative relationship. He remarked that the areas of cooperation could cover: staff and students exchange, co-teaching and sabbatical engagements. He added that “in this regard, we have designed short term programmes for staff as most often we forget about staff in such partnerships”. In his response, the Senior Assistant Registrar, Centre for International Programmes (CIP), Mr. Andy Agordah expressed confidence in the partnership. He hinted that he was glad Dr Lutabingwa has been frank and put all his cards on the table for discussion and for mutual benefit. “I think we have had a very frank and truthful discussion so far. We are grateful Dr. Lutabingwa outlined clearly the terms of agreement he wants with us. This helps to set the pace for a very good relationship which would last for a very long time.” He said. The Appalachian State University is one of the 17 campuses in the University of North Carolina system in the United States of America, with 19,000 students in more than 150 undergraduate and graduate programmes. Dr. Lutabingwa is seeking collaboration with the UEW and other Universities in Ghana. Also present during the visit were the Ag. Pro-Vice-Chancellor, Prof. James Kagya-Agyemang, Registrar, Surv. Paul Osei-Barima Esq, University Librarian, Mr. Viscount B. Buer, Prof. Egya Boakye Boateng (University of North Carolina - USA), Deans of Faculty (Winneba), Directors for the Institutes for Teacher Education and Continuing Profession Development (ITECPD) and Distance and e-Learning (IDeL) and Deputy Registrars.